Box text This Product is USED. Number of Players Release Date Release Data . This item is fairly worn but is functional. It could have cosmetic wear such as scratches or markings on the disk or a case/box. The case/box may also be cracked. Accessories such as codes, boxes, and instructions etc. may not be included. We ship Monday-Saturday and respond to inquires within 24 hours. Trending at $10.42eBay determines this price through a machine learned model of the product's sale prices within the last 90 days. Unit is used, and It has been tested to work fine. Minecraft - Xbox 360 Edition. Condition is Like New. Shipped with USPS First Class Package. Minecraft (TESTED & WORKING) Microsoft Xbox 360, 2013, RARE Game. Condition is Like New. Shipped with USPS First Class Package. Minecraft (Microsoft Xbox 360, 2013). Condition is Like New. Shipped with USPS First Class Package. 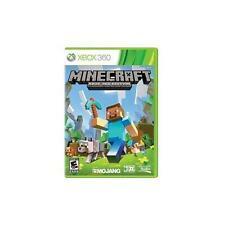 Microsoft Minecraft Xbox 360 Edition - G2W-00002. Condition is Very Good. Shipped with USPS First Class Package. Minecraft (Microsoft Xbox 360, 2013). Condition is Good. Shipped with USPS First Class Package. Minecraft (Microsoft Xbox 360, 2013). Condition is Very Good. Shipped with USPS First Class Package. The infinite possibilities in Minecraft just got bigger. Play Minecraft for Xbox 360 with Friends over Xbox LIVE, combine split screen and Xbox LIVE play in any combination up to 8 players. Let us know what the issue is and we will help you as best as we can. Trending at $15.25eBay determines this price through a machine learned model of the product's sale prices within the last 90 days. The case shows some wear and tear. Any codes that may be included with this item may or may not have already been redeemed by the previous owner and/or expired. All discs are cleaned by our Professional Disc Cleaner before they are shipped to you. All items ship Monday - Friday - Fast Shipping in a Safe & Secure Bubble Mailer. The case shows normal wear and tear. The original artwork is included. The game is in good condition but shows wear from normal use. The game is missing the original manual. Any code that came with the game has not been tested to determine if it works. The case may have stickers, markings, or sticker adhesive on it. All items ship Monday - Friday, in a secure bubble mailer. The item or product has not been tested! 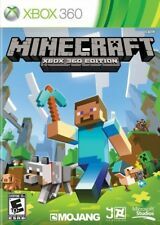 Microsoft Minecraft Xbox 360 Edition - G2W-00002. Condition is Good. Shipped with USPS First Class Package. This listing is for the game with case. Manual not included. Guaranteed tested and working. Please feel free to ask any questions or request additional pictures. Thank you for shopping. Minecraft (Microsoft Xbox 360, 2013). Condition is Acceptable. Shipped with USPS First Class Package. Disc only and has been tested disc does have some surface scratches. Tested and works great. Some light to regular wear to the case and some light wear to the bottom of the disc, but is in good condition otherwise. NEW FACTORY SEALED. FACTORY SEALED! (SPECIAL PRICE). The object for sale is ONE item (unless otherwise indicated). Minecraft [Xbox 360]. Condition is Acceptable. Shipped with USPS First Class Package. Condition is Good. I want you happy!I have a policy to always treat everyone the way that I would like to be treated! I am always happy to discuss any details or concerns that you may have and find answers or solutions that will make everyone happy. 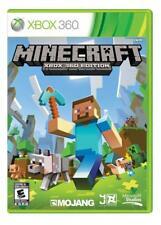 Minecraft Xbox 360 Edition - Microsoft - Shipped with USPS First Class Package. some minor scratches, manual not included, sticker on back bottom right, see photos for condition • If you have any questions, please ask. • Photos are also a part of the description • Customer satisfaction is our #1 goal. • If for any reason you are not satisfied with your purchase, please email us through eBay so that we may offer you a solution to the problem. • Returns must be in the same condition as received. 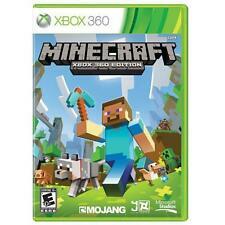 Up for sale is MINECRAFT for the X-BOX 360 SYSTEM. The 72 Pin Connector inside of your original Nintendo console is the key to the longevity of your system. IMPORTANT INFORMATION ABOUT YOUR NINTENDO SYSTEM! Minecraft for Xbox 360. This item is genuine, original. If you are not happy with it we will work to fix the problem. Just let us know. Super Nintendo. Sega Genesis. Sega Dreamcast. Playstation 3. PICTURE SHOWN IS ACTUAL ITEM(S) RECEIVED. Minecraft Xbox 360 Edition Disc With Case Tested. Condition is Very Good. Shipped with USPS First Class Package. Has been tested and plays fine. Winner will receive exact item pictured! SEALED in the original plastic wrap!